It is about that time of the year for the Fall chapter of our Mister Freedom® x Sugar Cane MFSC “Men of the Frontier” Collection. 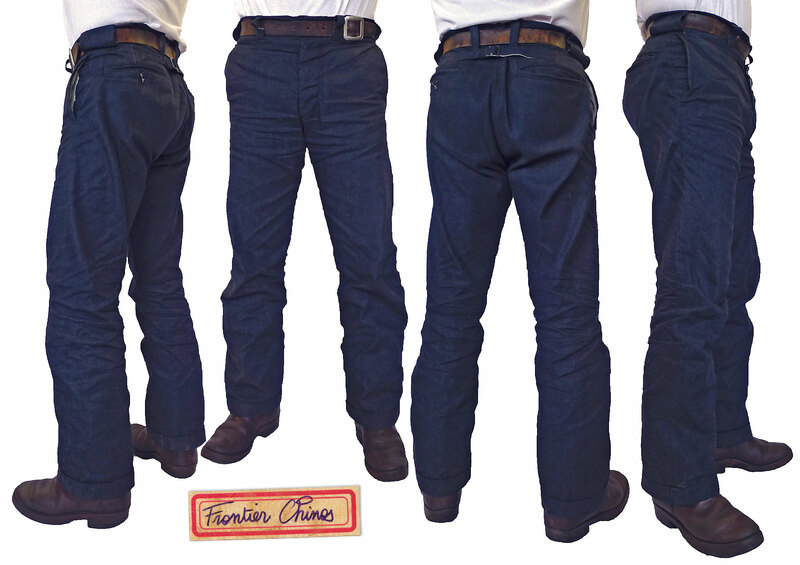 The first installment for Fall 2012 is the “Frontier Chinos”. These trousers are a combination of several vintage work pants styles. The construction and pattern are inspired by 1930’s ~ 40’s light weight twill work chino uniforms rather than the traditional and widely replicated US military type chino pants. However, the silhouette could be reminiscent of a late 50’s ‘Ivy League’ classic slacks type, with its slimmer legs, fitted seat and mid rise. You can always size up for a ‘roomier’ look, and use the cinch back strap. We wanted pants that didn’t ‘scream’ skinny or baggy, but just looked like… men’s pants. 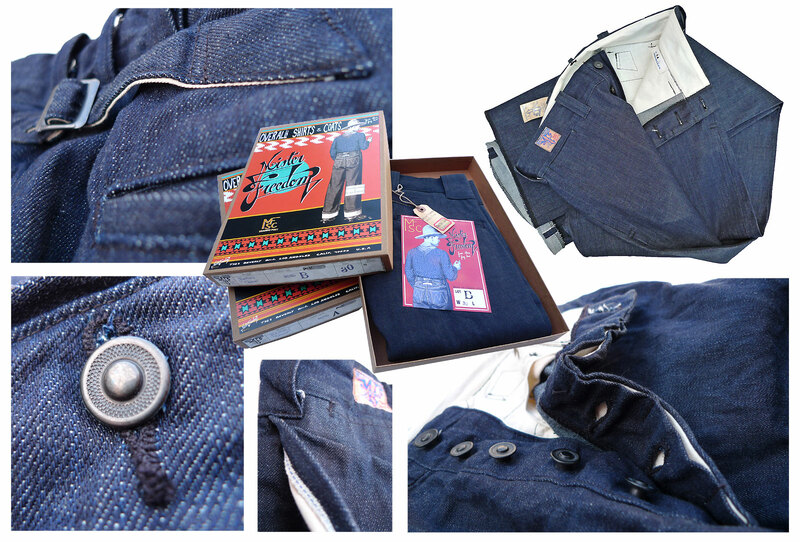 We used two types of USA made New Old Stock (NOS) denim for the production of these trousers. The fit is consistent in both options, only the denim weight/feel differ. We opted for a ‘tailor shop’ look and left the bottom open, so you get to choose your preferred way of hemming them. They are made in Los Angeles, USA. 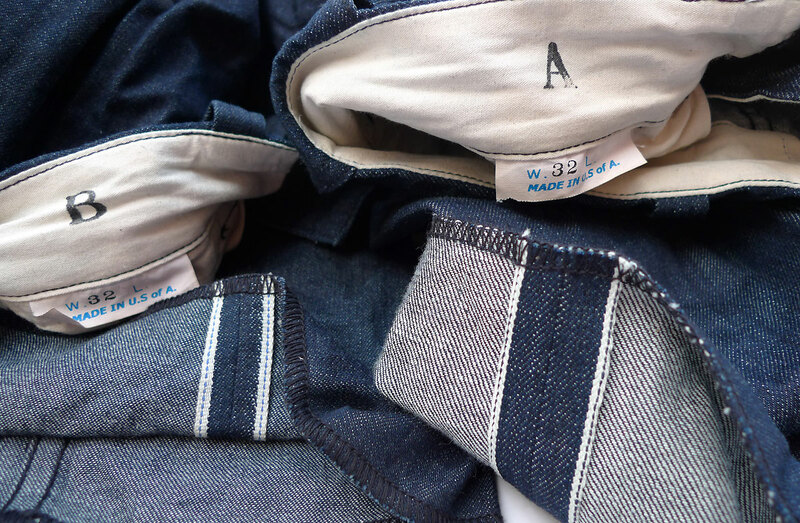 Cut & sewn by skilled workers in a clean and solid American factory. PATTERN: An original MFSC® pattern, influenced by vintage work type chino pants. 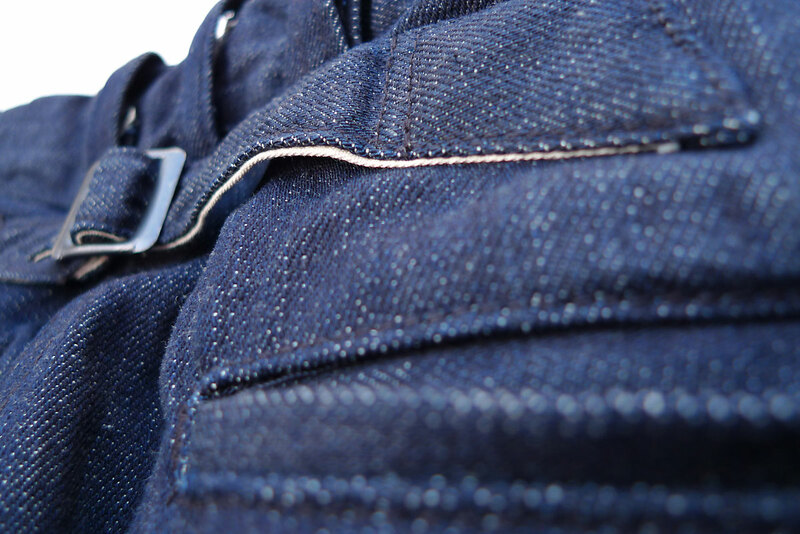 FABRIC: Two limited batches of raw NOS selvedge denim, made in USA. * Slender silhouette, mid rise. * Metal ‘Deco’ riveted waist/fly buttons, gun metal color. * Cinch back strap, with vintage French NOS metal slider buckle. * Wide and slim belt loops combination. * Flat felled seam sit and inseam construction, selvedge leg side seam. 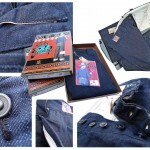 * Front slash pockets (with concealed selvedge opening fold), coin pocket, back welt pockets. * Traditional 100% cotton unbleached ‘Sail Cloth’ pocket bags and lining. * Black 100% cotton thread construction. * Original MFSC® woven rayon label, concealed under the belt. 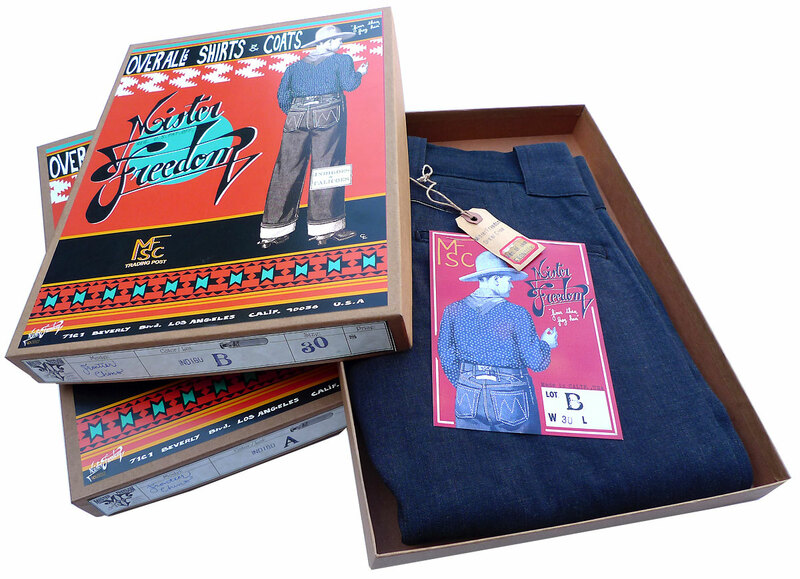 PACKAGING: For the USA, the Frontier Chinos come in an old school cardboard box with original MF® artwork. This sturdy box is not the collapsible cheapo kind, and can be used for storage of small items. Please re-use. 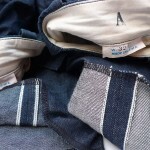 SIZING/SHRINKING/WASHING: The trousers come unwashed/raw. 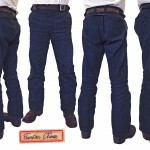 Because the denim is sanforized, the shrinkage is minimal in length/width (1%~2%). They are true to size, meaning a tagged Waist 32 measures about 32’’ before and after rinse. If you are a 32’’ waist, you need a tagged 32. Do not boil/machine dry your pants to get them to fit: get your correct size instead. The un-cuffed inseam is about 37 ½’’, plenty room for non NBA players to hem to their liking. As always, we recommend an original cold soak for about 15-20 mn/spin cycle/line dry. The Sail cloth lining shrinks slightly more than the denim does therefore giving a nice ‘roping’ effect after dry. As with all raw denim, indigo color bleeding/rubbing is expected in the early months of wearing. Call 323)653-2014 or mail sales@misterfreedom.com to get yours while they last. We ship almost everywhere internationally. Much obliged for the support, Friends.